The 2012 Bay Moon Sauvignon Blanc is a Trader Joe’s exclusive, $5.99 in the Midwest, sourced from vineyards located in the Monterey AVA inside the larger Central Coast AVA of California. The Bay Moon brand is part of the Trader Moon line of wines, that are produced for Trader Joe’s by the Delicato Family Vineyards, that also make Gnarly Head, Brazin, Noble Vines, and Bota Box along with several others, they specialize in “bang for the buck” value priced wines. So, the Bay Moon is something of a rarity, a vintage specific wine (2012) sourced from one AVA (Monterey) and selling for under 6 bucks, this is usually non-vintage, multiple AVA territory. The alcohol content is 13.5%. The color is a pale butter yellow with a green olive tint. The nose is your typical huge Sauvignon Blanc aroma, it hits you from two feet away, tropical fruit and floral along with ripe juicy peach. This is a dry Sauvignon Blanc with a bit more body than you would expect for a $5.99 wine. It tastes of a mix of pear, lemon, unsweetened pineapple, green apple and lime juice. The mid palate adds a soft hit of sour hard candy and dried apricot. The acidity puts a nice shine on all the flavors and allows a rather subtle finish linger on and on and on. 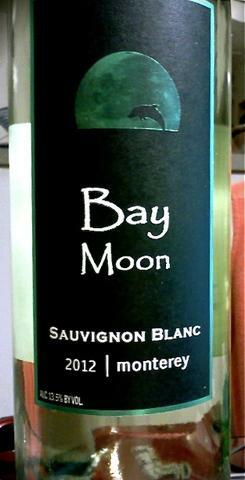 The 2012 Bay Moon Sauvignon Blanc is a solid, no issues, tasty, well made, versatile Sauvignon Blanc, that just happens to cost less than six bucks. The Bay Moon would work vary well with shellfish, shrimp, crab or lobster, either cooked or in a salad. You would think that if you had a get together and splurged on lobster for your guests, that a $5.99 wine just would not do, but you would be wrong. The Bay Moon Sauvignon Blanc would pair perfectly, you could pay more for a wine to pair with your meal, but this little $5.99 wine would definitely do the job in style.